Photograph of a figure of Ganga on the gopura of the Jalakanteshvara Temple at Vellore, Tamil Nadu, taken by an unknown photographer ain c.1870, from the Archaeological Survey of India Collections. The Jalankanteshvara Temple is built in the Vijayanagara style and dates from the 16th century. The complex is enclosed by high walls and is entered on the south through a tall gopura, or gateway, which consists of six diminishing storeys. The first two storeys are decorated with mouldings and carvings. 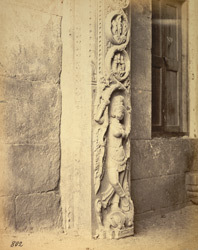 This view shows a figure of the river goddess Ganga at the base of a pillar on the gopura. The goddess holds a long scroll in which small figures are carved.